In some court matters, it may be necessary to file a declaration -- a signed statement from a declarant, who swears under oath that the information provided is true and accurate. If you live in the Golden State, Nolo's simple California General Declaration will help you collect this information and make sure that it's valid under California law. 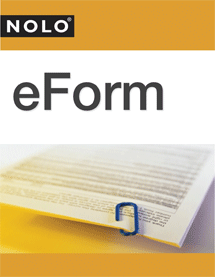 Nolo's legal forms are reliable and fully up-to-date -- plus, they include instructions written in plain English to help you through the process of preparing your document. You can find a full list of Nolo's products written specifically for California law here.